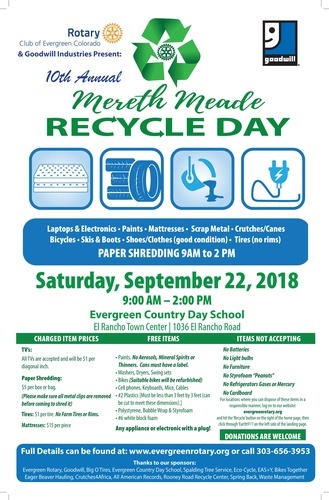 The 10th Annual Mereth Meade Recycle Day is an opportunity for our local households to dispose of hard to recycle items. Old TV's, laptops, electronics, skiis/boots, paper shredding, tires (no farm tires or rims), mattresses/box springs, plastics, polystyrene, styrofoam, metals, paint, car seats, bicycles, clothing, shoes, Note: small fees for TV's (by the inch), paper shredding and bedding. Donations to cover hard costs are welcomed!